There is a new “commanding presence” on the New Castle County Courthouse (NCCCH) Plaza -- an imposing sculpture that is designed to celebrate the development of law from earliest times (Hammurabi Code, Greek and Roman Law) through modern days (the Bill of Rights and the United States Constitution). 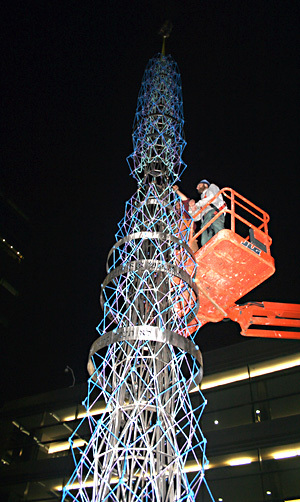 The 51 foot tall tower has an illuminated glass lantern at its core, a multicolored stainless steel framework, and bands of text containing legal themes from history extending around the central sculpture and throughout the seating areas. The lantern light, symbolizing the “light of justice,” will be lit at the dedication ceremony on Monday, January 22, 2007. During Brower Hatcher’s career, spanning close to thirty years, he has created many major works of art for public sites. The New Castle County Courthouse, through the work of the NCCCH Art Committee, is fortunate to serve as home to this significant and inspirational display of art. In addition to the Brower Hatcher sculpture, the NCCCH Art Committee recently received a donation of six abstract impressionist paintings by Daniel K. Teis. These colorful paintings greatly enhance the public space in several locations in the NCCCH.